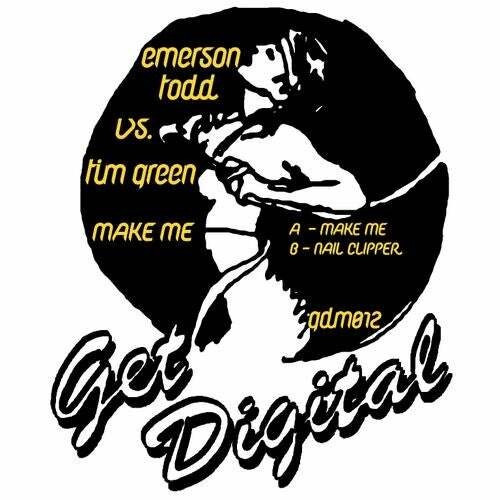 The United Kingdom and New Zealand unite on the latest Get Digital release, as Tim Green and Emerson Todd team up for two tracks of trendy Tech-House. Both of these guys had a splendid 2009. Tim with his releases on Dirtybird and Emerson providing a contribution to Get Digital, at the end of last Summer. Their initial collaboration came in the form of 'Exercise', which popped up on a compilation from Sven Väth's admired Cocoon label. 'Make Me' is driven by crisp and tight beats that one would expect from these two producers, before tumbling into a 1920's speakeasy jazz drum solo. A flurry of vocals shoo off the drummers as the beats takeover again with an intensified energy. After all that dancing, you will surely need some foot treatment. That is where 'Nail Clipper' takes over. A sonic pedicure, to easy your tired toes? Not quite. This one contains even more energy than the first with a stepping break that won’t in a million years give comfort to sore feet. When two overqualified producers team up, one always wonders: Will the skills cancel each other? Can their workflow translate into a superlative soundscape, or just a collection of sounds? Luckily these two artists walk that fine line making them a compatible and capable pair to create two unique dance floor weapons.